This is just yet another blog about BWonHANA (BoH). In particular it is about changes in the BW system that was brought to HANA DB offers. Basically I go through things that are visible once the BW system is migrated to HANA DB. 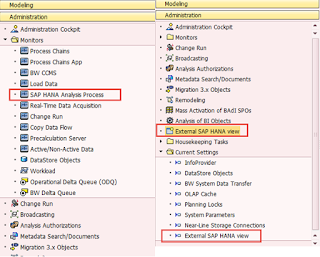 Modeling -> “SAP HANA Analysis Process” there is a new section called or HAP. The HAP enables to run SAP HANA native functions (e.g. AFL functions like PAL or L or R scripts or SQL procedure) directly on BW’s InfoProvider. The data can be processed as data set as opposite to classic BW transformation. Each HAP process has source (it can be most of most BW InfoProviders) then function and finally target (Analytic index, DSO, DB tab, or another HAP process). Modeling -> InfoProvider -> cubes: Star scheme of classic BW’s infocubes was reorganized to just 2 tables: fact and 1 dimension table. There is only package dimension which has its own dimension table available. The SIDs of all other characteristics are stored directly in the fact table. 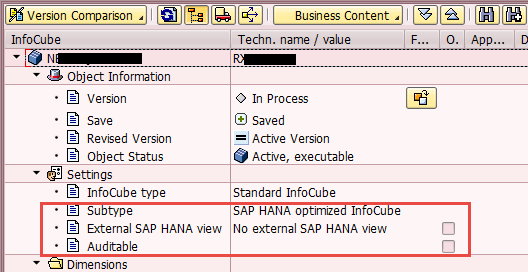 External SAP HANA view: flag that tells an external SAP HANA view is generated for the infocube. 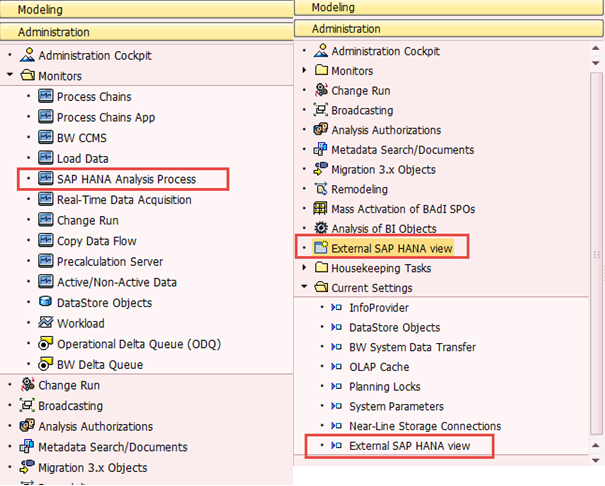 The external HANA view can be used by native HANA apps as interface to BW models and data. Auditable: if this flag is set then an audit dimension is added into the cube. Later it can be used to cover audit reporting to e.g. see who and when did a change into planning data in case of planning cube. 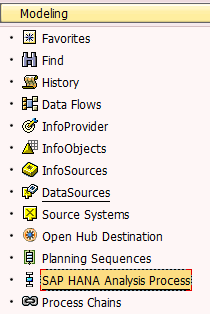 Modeling -> InfoProvider -> DSO: here is new flag call “External SAP HANA View”. See below on IO part for details of this flag. 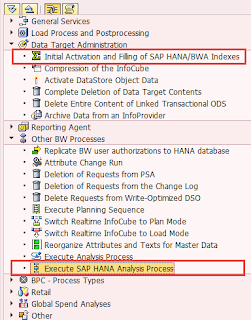 Modeling -> PC: There are few new processes related to Hana within process chain’s processes. Especially when it comes to Execution of the HAP processes. Modeling -> TRFN: in the menu Extras of Transformation maintenance screen there is a possibility to display generated HANA transformation similarly as it is possible to display generated ABAP program. Modeling -> DTP: On the DTP maintenance screen here are following new things. 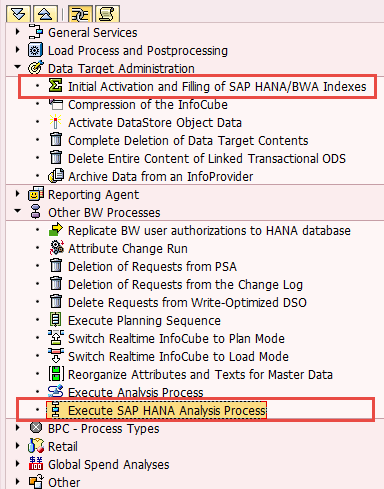 First there is a checkbox which indicates whether the DTP shall be executed in HANA. In this case all data is processed directly by the database no ABAP app server is involved. This mode of execution is called SAP HANA Processing mode. In addition to the checkbox there is a button called “Check Availability”. This button helps to determine whether the DTP can be pushed to the HANA DB for execution. There are few prerequisites that must be met in order to have the possibility to execute the DTP in HANA. See here for details on these prerequisites. Modeling -> InfoObjects: Here at IO maintenance screen there is couple of new things as well. First there are field SAP HANA Package and SAP HANA View. These serve as source of data for the IO (e.g. MD). By this the data from the IO will be taken from SAP HAN View specified here. The Package field says where in which HANA package the view is stored. Moreover there are also following checkboxes. They are following ones: “External SAP HANA View for MD” and “External SAP HANA View for MD InfoProvider”. These two basically serves for purposes of generating SAP HANA Views for InfoObjects. Having the view generated enables consumption of BW data in the HANA. 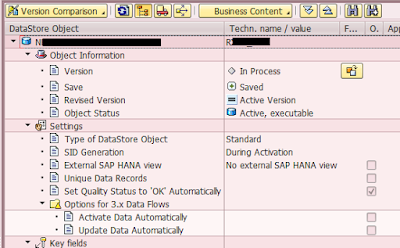 This supports so called mixed scenarios when BW data and HANA data is merged together in HANA with HANA tools. See more details about the flags here. Of course there are some restrictions. For details on the restrictions see here. Administration: Also here some new objects and features can be spotted. On general Admin view there is an External SAP HANA View part. It can be used to view the Views. On Monitors view there is a monitor screen available for the HAP processes. It servers for monitoring of the HAP runs. On Current Setting part a settings related to External SAP HANA Views. Transport Connection obviously also here few new objects were added in order to support operations with them. 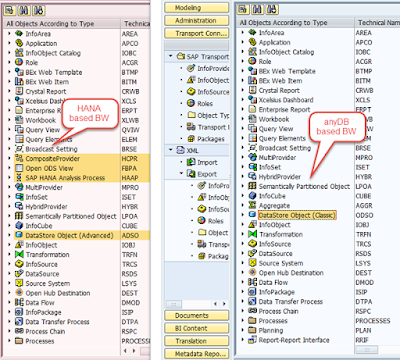 See below comparison between how the Transport Connection screens look like in BW 74 system on any DB and on HANA DB. That’s all for now! 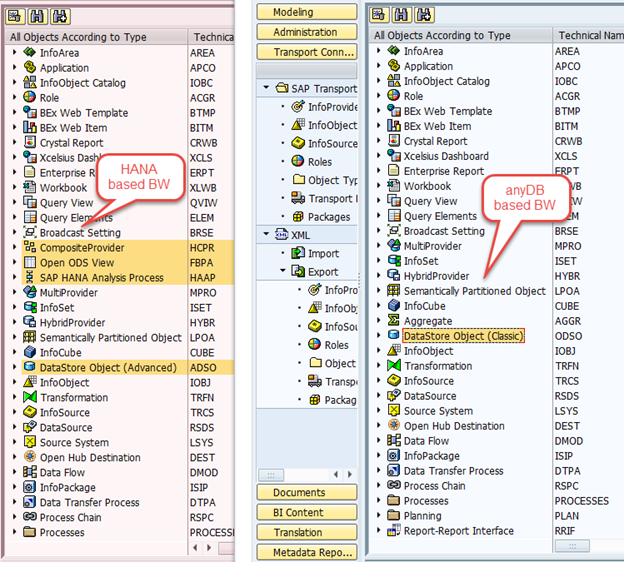 As a disclaimer I need to say that there might be many more ways how to observe the new exciting things that are coming to BW system while running on HANA DB.